The mold and deckle in this project is an essential tool for handmade papermaking presented in the Handmade Paper from Recycled Scraps craft project. Handmade paper is made with a mold and deckle. 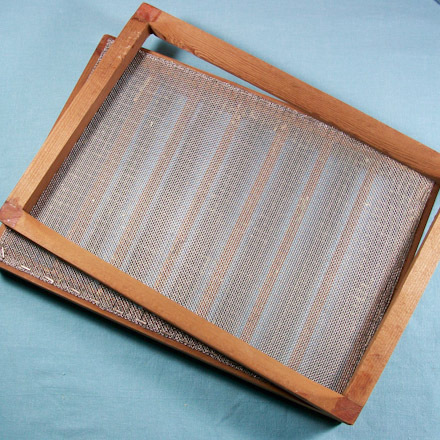 The mold is a frame covered with metal or nylon mesh, and the deckle is the frame that sits on top of the mold. The paper is formed on the mold, and the deckle is used to create straight edges on the paper sheet. You can purchase a mold and deckle from craft and art supply stores, or make one yourself. A mold and deckle can be made from scratch or with recycled wood picture frames. If you are a beginner just wanting to experiment with papermaking, a mold and deckle can be made from plastic canvas, duct tape, and cardboard. All three options for making the mold and deckle are presented below. Related craft: Handmade Paper from Recycled Scraps - Make paper by hand from recycled scraps of paper. Cut four 8" (20 cm) and four 9" (23 cm) lengths of wood. Glue the wood together to form two identical 8" by 9" (20 cm by 23 cm) frames. Reinforce each corner with a brass plate screwed in place. Sand any sharp edges, and varnish to make water-resistant. If you use a water-resistant wood, like redwood, skip the varnish step. Cut a piece of nylon or metal mesh to fit the mold. Stretch taut and staple in place. 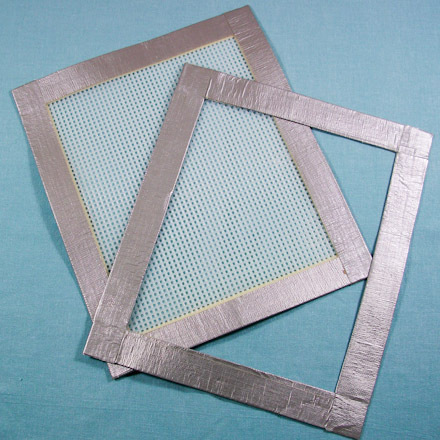 It is important that the mesh is stretched tightly and evenly over the top of the mold. Go to Handmade Paper from Recycled Scraps craft project. That's it! Your mold and deckle are ready to use! Clean the frames, removing any staples or other hardware. Sand any sharp edges, and varnish to make water-resistant. Cut an 8" by 9" (20 cm by 23 cm) rectangle of plastic canvas to form the basis of your mold. Cover the edges of the plastic canvas with duct tape. Cut an 8" by 9" (20 cm by 23 cm) rectangle of stiff cardboard, then cut out a 6" by 7" (15 cm by 18 cm) rectangle from the center. This will leave a frame to use as a deckle. Cover the frame (deckle) with duct tape to waterproof. Tip: For beginners and kids, make a simple mold and deckle using plastic canvas, cardboard and duct tape. This mold and deckle will last for many uses if the cardboard is fully wrapped in the duct tape to keep it watertight.